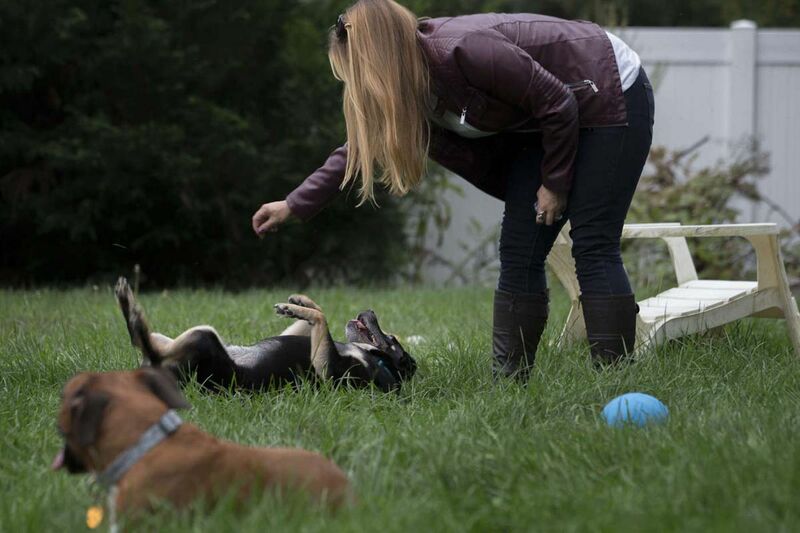 Hollie Rothrock plays with her dogs Rosco and Stella at her home in Yardley. While you can’t put a price on the companionship your furry family members provide, you can put a price on vet fees, medication, grooming, training, kennel stays, dog walkers … and the daily cost of food. Checkbook’s articles and ratings of veterinarians, dog groomers, kennels, pet insurance, house sitters and dog walkers, and trainers provide pet-related money-saving advice. Through a special arrangement, Inquirer readers can access all of Checkbook’s ratings for free through May 7 by visiting the website below. Here we tell you how to dish out Fido’s favorite food for a little less scratch. Checkbook’s shoppers checked prices for 11 popular dog and cat foods at pet stores, big-box discounters, grocery stores, warehouse clubs, and online suppliers. Because the various stores often stock different-size packages, Checkbook shopped for the lowest prices on a per-pound or per-ounce basis for each product. Among retailers with local stores, Sam’s Club, BJ’s, and Walmart offered the lowest prices for the items checked. Sam’s Club’s prices were 25 percent lower than the average prices at all the retailers Checkbook surveyed, BJ’s prices were 22 percent lower, and Walmart’s 18 percent lower. Prices at national chain PetSmart were six percent lower than the all-store average while prices at Petco were about the same as the average. While Costco also offers low prices for pet food, because it for the most part carries only its own Kirkland brand, Checkbook could not compare its prices to the others. Checkbook had the same problem when checking prices at most independent pet stores; many carry few mass-market brands. But these stores typically offer better advice and service than the behemoths—and unlike the big discounters, you can get in and out quickly without accidentally buying a gallon of mayonnaise. For many types of products, you’ll get the lowest prices from online retailers. But that’s not necessarily the case for pet food: All the websites Checkbook shopped were more expensive than price leaders Sam’s Club, BJ’s, and Walmart. But if you want someone else to schlepp your dog’s 50-pound bags of food, the least expensive online option Checkbook found was Chewy.com, which had prices about 12 percent lower than the all-store average. Amazon’s prices for the products in Checkbook’s survey were three percent higher than average—more expensive than several other online retailers’ and about 17 percent higher than Chewy’s. Some online retailers offer small discounts (typically five percent) if you agree to sign up for regular deliveries of pet food. It sounds like you’ll risk an avalanche of unneeded kibble, but the websites make it easy to cancel or suspend orders. Chewy’s five-percent auto-ship discount makes its prices more competitive with the lowest-cost local outlets. The bad news is that many retailers exclude lots of products from their auto-ship discounts. But if you want to buy online and your pet’s favorite food gets a discount under an auto-ship program at a low-cost online retailer like Chewy, grab the extra savings. Delaware Valley Consumers’ Checkbook magazine and Checkbook.org is a nonprofit organization with a mission to help consumers get the best service and lowest prices. We are supported by consumers and take no money from the service providers we evaluate. You can access all of Checkbook’s ratings free of charge until 5/7/19 at Checkbook.org/Inquirer/PetFood.